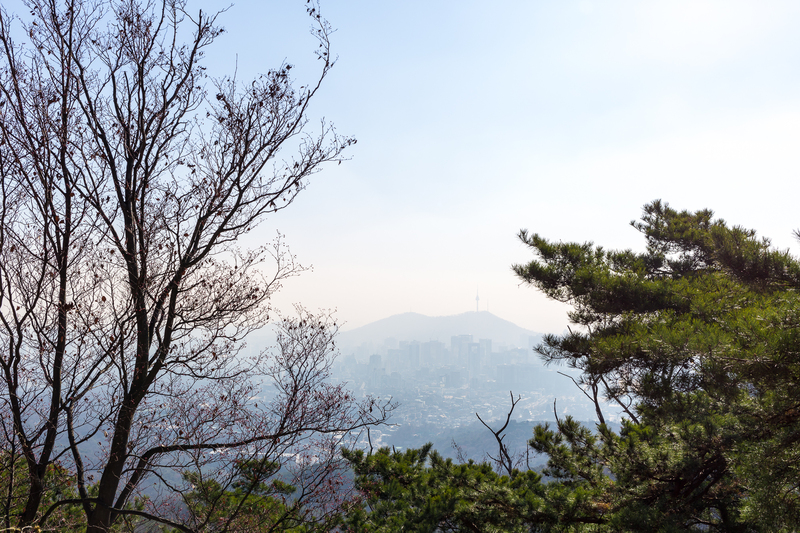 I ended up choosing Seoul — far enough away to be a complete difference from Europe, but not so culturally unfamiliar that I’d be unraveling for days over what I saw, learned, or ate. (Nearly every English-speaking Korean I ran into assured me I looked Korean; these aren’t just Western stereotypes!) 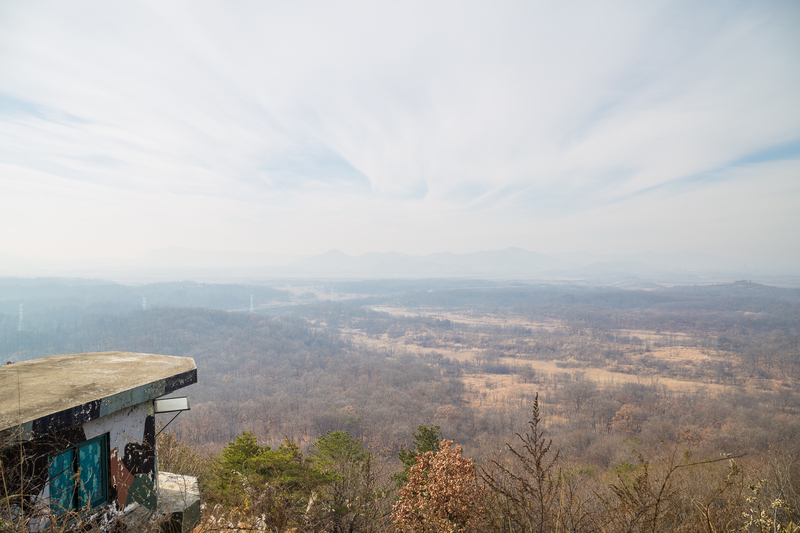 I had a rough idea of what I wanted to do the three days I was there: Bugaksan and wandering around the city the first day, visit the DMZ on the second day, and tour the palaces on the third. In hindsight, I seem to have some attraction to visiting Asia for short periods of time. And what is it with these places that begin with “S”?! 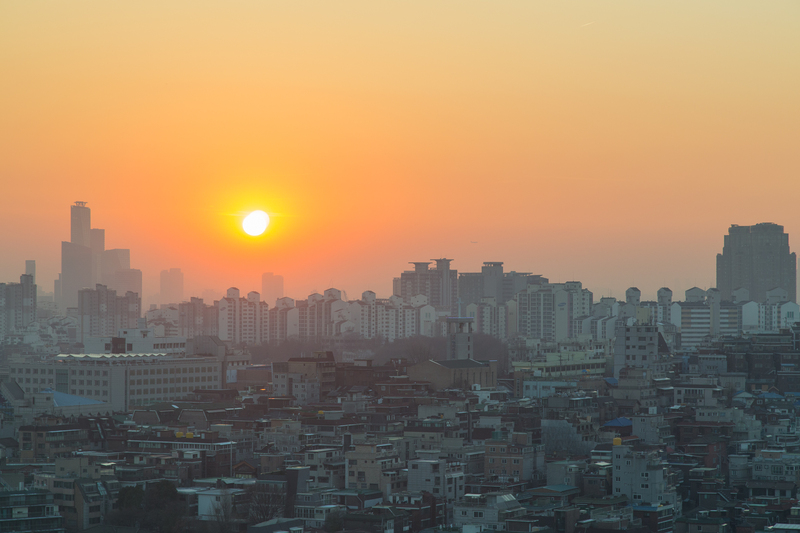 Seoul is a densely populated city surrounded by mountains, which makes it as far as population is concerned the direct opposite of Kempten. I had originally intended to hike, but not wanting to lug hiking gear to Korea and then onward to the U.S. I settled for an easier walk on Bugaksan, near the president’s house and the site of an 1968 assassination attempt by North Koreans. Though the mountain was reopened for tourism less than ten years ago, there are few locations where photography is allowed. The views were also thickened by haze, but seeing the sprawl from the tranquility of above was fascinating. I’ve found that for me, morning hikes are more enjoyable after breakfast. This one wasn’t difficult — maybe only 300 vertical meters — but I wasn’t sure what to eat that morning. Normally I’d have a sandwich or cereal before I left, but as my goal was to explore I walked around a small market near the apartment and stopped in a tiny shop off the side of the main road. Unable to read Hangul, and the owner unable to speak English, I pointed at an item on the menu. It turned out delicious! Apart from being near that delicious market (Thursday’s breakfast, also a menu-pointer, was also great), the apartment was on the 20th floor (19th for Europeans) and had a great view over Seoul. The only day I got to see a sunset was hazy but colorful. Another benefit to the apartment was its proximity to Camp Kim, also the location of the Korean USO. I had breakfast in the apartment Wednesday morning and walked the mile or so to the USO and joined forty others on a one-hour bus ride toward that infamous parallel. It’s hard to qualify the experience. One the one hand, it’s about the safest active war zone in the world to visit. On the second, a “safe active war zone” reads with a tinge of irony. Nevertheless, looking — and stepping, briefly, inside the conference rooms at the Joint Security Area (JSA) — into North Korea is a memorable experience. 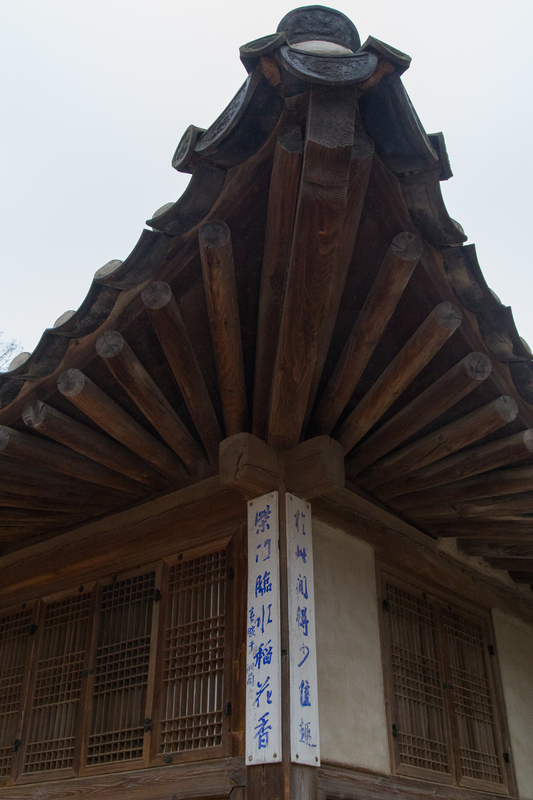 There were no KPA soldiers peering inside the buildings this tour date, only curious visitors and stern-faced ROK guards. Later in the tour, we stopped at the Dora Observatory. There are military watchtowers here, but on clear days the row of binoculars allows for decent views into North Korea. 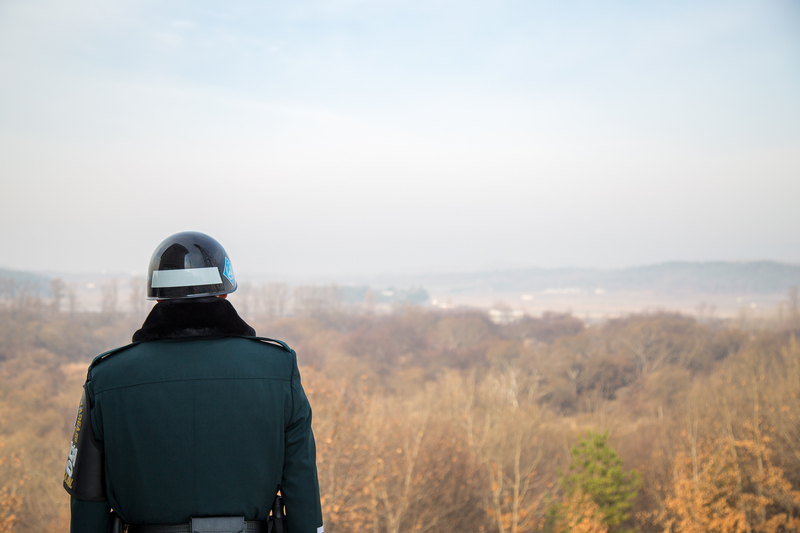 Ours was unfortunately not a clear day, but the apparent dearth of anything living in the 2 km-wide demilitarized zone (DMZ) hinted at the tenseness of the silence. 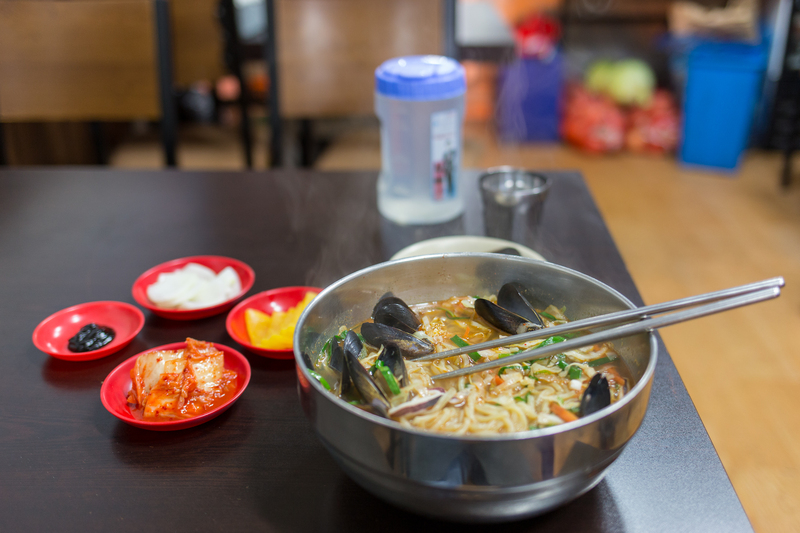 That night, I ventured into the city for a meal and chose the Gwangjang Market. 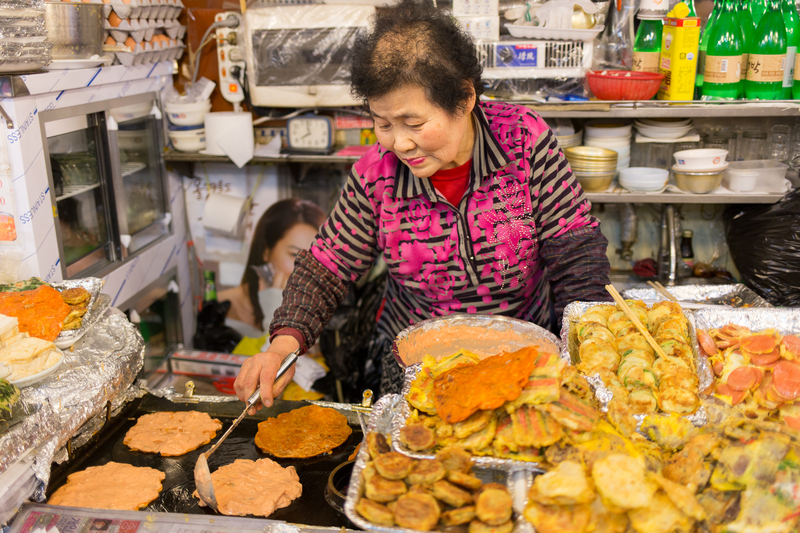 Not knowing what the foods were, I sat down at a stand and ordered what was probably two or three pounds of Jeon. (Somehow, despite walking around the market twice before sitting, I missed stalls that had other foods.) It was good, naturally, but little did I know that this is usually an appetizer, eaten while drinking [presumably heavily], or as a side dish. Instead, I made it my main course, lack of language skills scoring a point. More important: I wish I could have spoken to the cook. She has been doing this for many years; a magazine cover that hung behind her right shoulder from the 1990s has her proudly offering up one of her specialities. The next day was my last day in Seoul and also the first day with rain in the forecast. 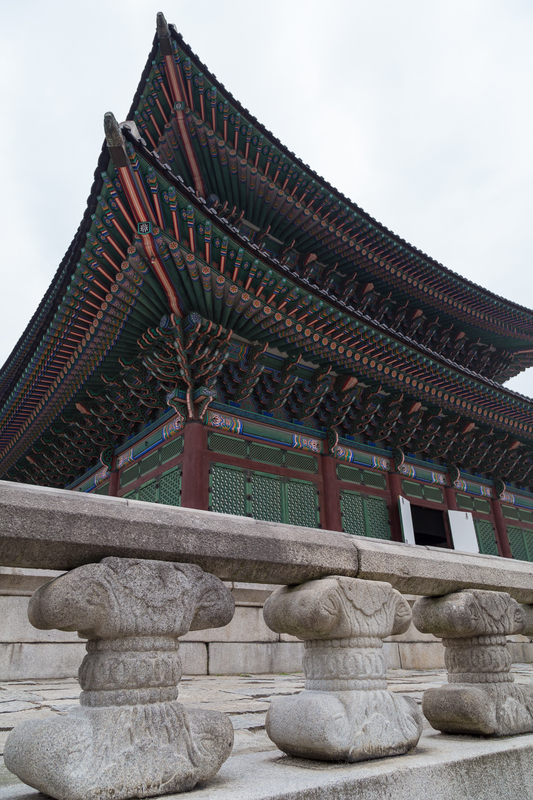 I took the opportunity to get out to Gyeongbukgong Palace before the raindrops fell and before the crowds awoke; as such, the grounds were practically empty when I arrived. 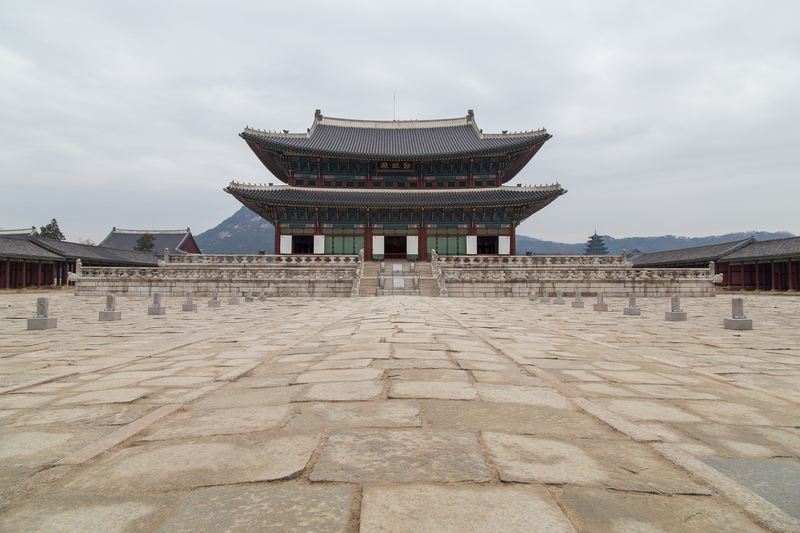 The path leading to Geunjeongjeon, the main throne hall of the compound, is divided into thirds: one for military, one for civilians, and one for the king himself. Without visitors standing along the path, it’s not hard to visualize its use hundreds of years ago. Most of the buildings in the palace were beautifully decorated, having been restored after their destruction about 100 years ago. 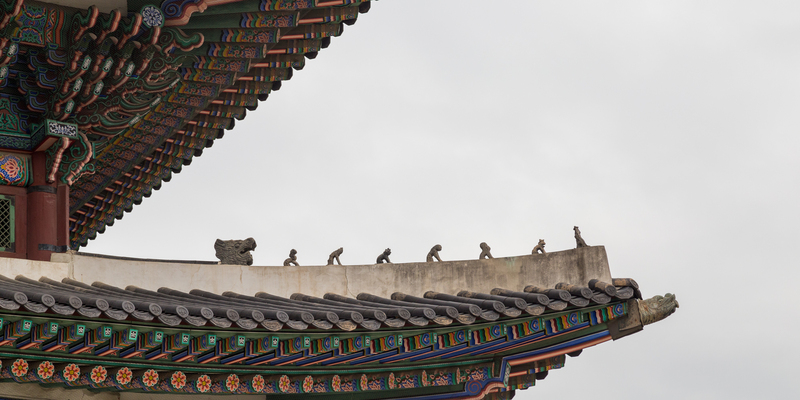 Along the roofs, at each corner of the building are small decorative figurines (Japsang) intended to keep away evil spirits. Even they, far above the ground and hardly suspect to periodic scrutiny, were beautifully crafted. 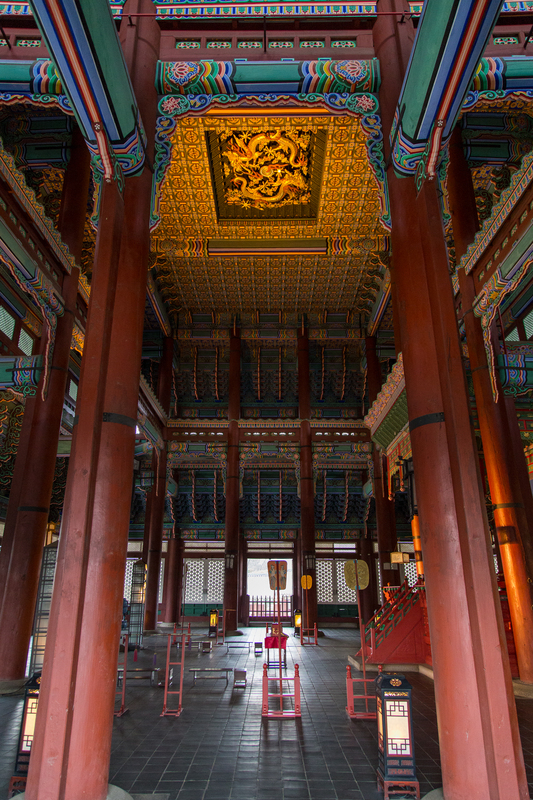 If the president of the United States wields considerable power now, there is no doubt how much reverence the king commanded then: in Geunjeongjeon, a pair of dragons dominates the ceiling above the king’s throne. 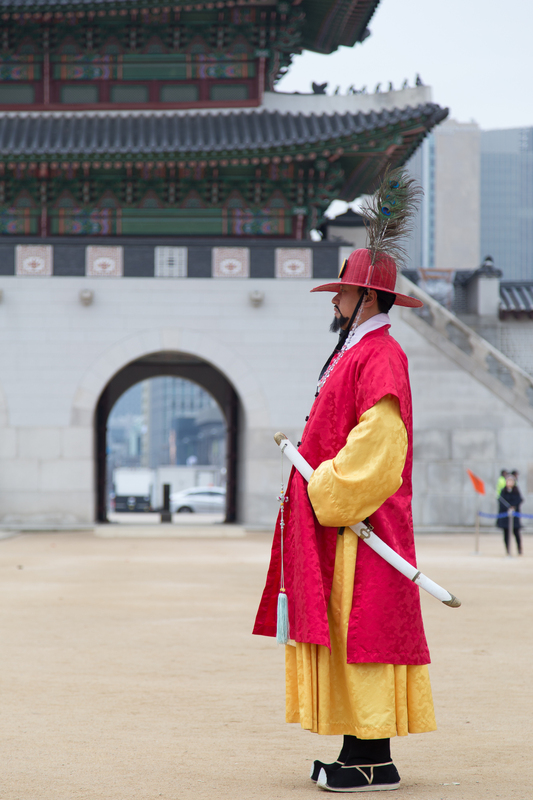 About an hour after I arrived, other visitors began pouring into the courtyard just beyond the main gate, Gwanghwamun, for the periodic guard-changing ceremony. It’s far less somber in demonstration and less hushed in audience than the ceremony of the same name held at Arlington National Cemetery, though here, too, a light rain is not enough to deter people from attending. I wrapped up my visit with a tour though the grounds. It is impressive that so much attention could be focused on such small details. Not having to jostle for space to take photos of such details made taking pictures a lot easier! 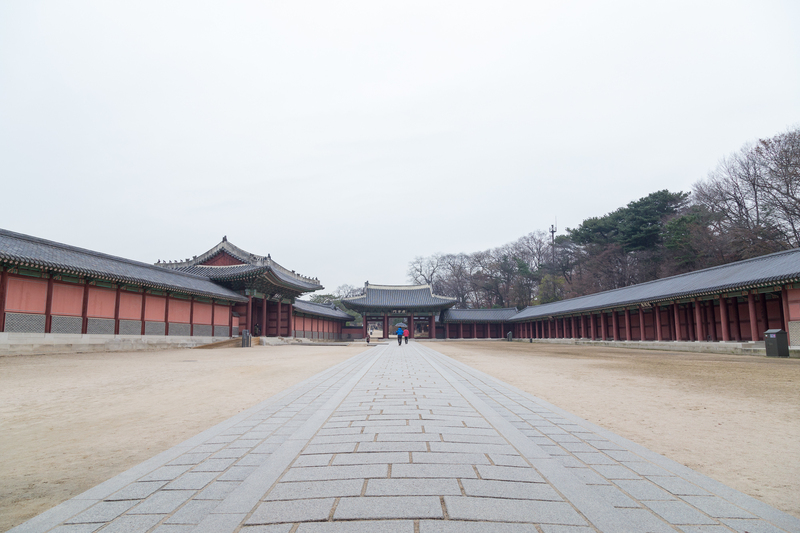 That afternoon, I visited a second palace, Changdeokgung. Here, too, the courtyard was almost empty; the drizzle came and went throughout the day, never enough to soak but not stopping for more than half an hour. One of the highlights of the UNESCO World Heritage site is its rear garden. On the dreary water day I visited, it wasn’t particularly colorful; no flowers were in bloom, the lily pads were empty. Although most buildings were richly decorated, the areas for the servants had roofs in stark contrast to the bright displays of the royal family’s buildings: they were left unpainted. By 4 PM, the rain did finally let up for more than half an hour. I headed to the airport after dinner and enjoyed a ride on a Turkish Airlines 777-300ER (you didn’t think I’d go a whole international post without mentioning planes, did you?). After landing in Munich a few hours after sunrise, I headed into Munich to wander around the big, friendly city. 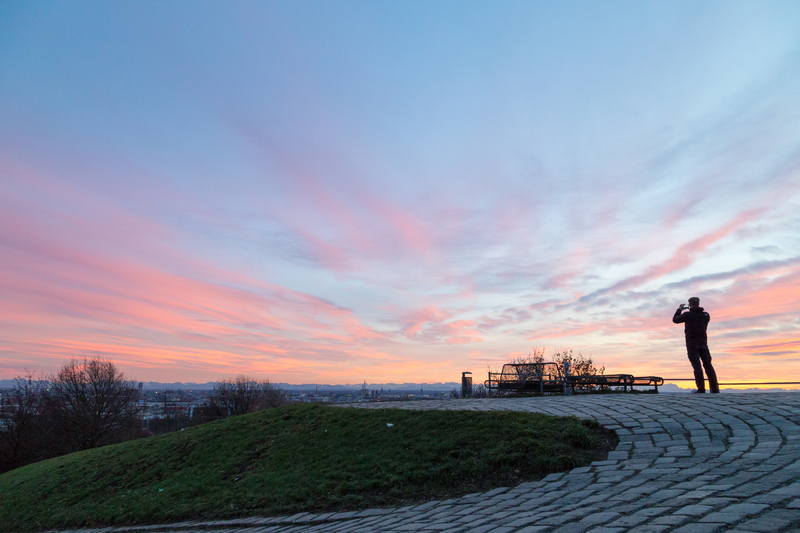 While there, I decided to catch the sunset at Olympiaberg. 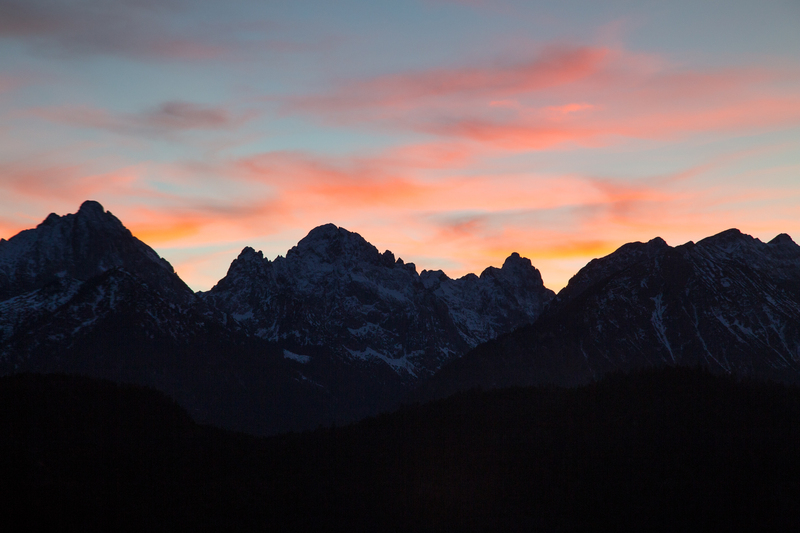 At first it was just cold and windy with clear views to the Bavarian Alps a hundred miles away, but the clouds looked promising. After about half an hour, the show began, and everyone came to watch. 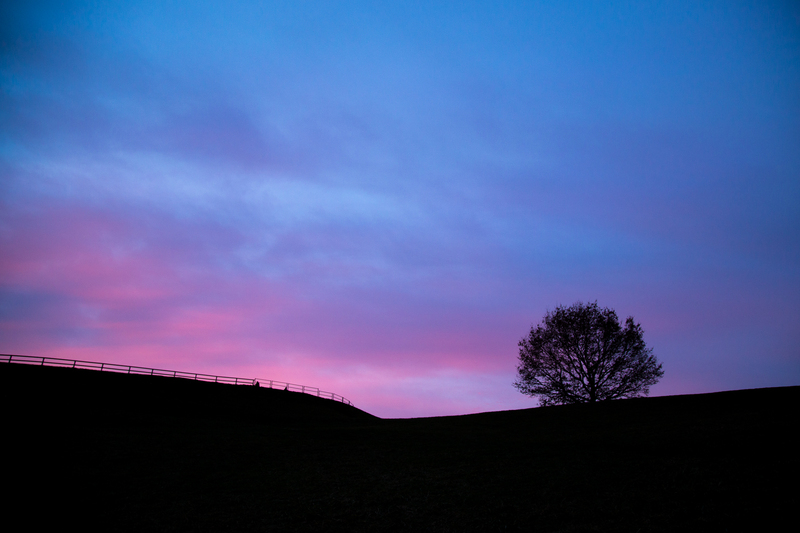 It is not in my experience that a sunset last for more than ten minutes per showing, but the colors swirled overhead for a good forty minutes before subsiding. 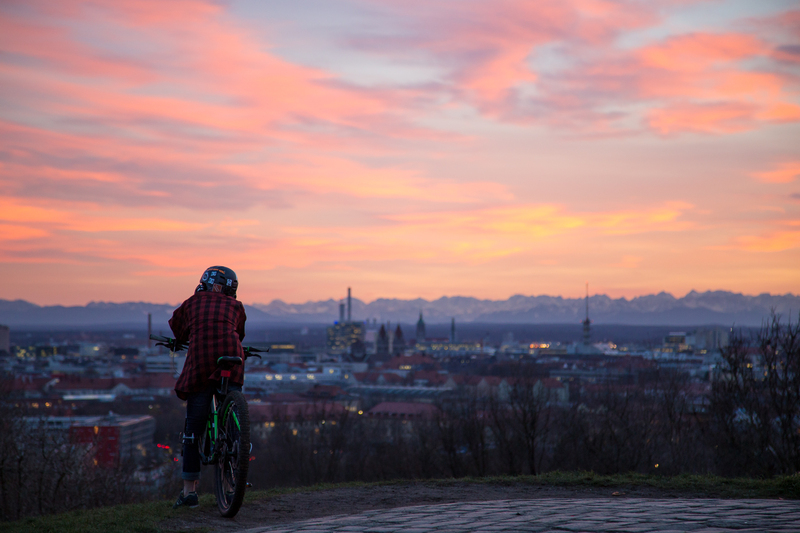 I had no intentions of spending a good chunk of my evening standing on a hill in an otherwise flat Munich, but there was a quiet satisfaction to starting and ending my trip with incredibly colorful sunsets. There’s no question that I’d rather spend it at the Riffelsee while contemplating the Matterhorn, but this was a wonderful delight. As usual, your photographs are outstanding and your written comments so thoughtful. Thanks for the surrogate tour! Early summer, I will re-visit Paris and Edinburgh and hope to capture the feel and essence of places I last toured (briefly) about 40 years ago. Well, bummer, somehow I never saw this comment! Thanks for the nice words. Looking forward to seeing your pictures in Europe!